I bought a packet of semolina last month as one of the recipes, fried calamari, called for it. Then I used a table spoon or two only. The left over (almost the whole packet) was just sited in my kitchen cabinet for almost a month. Last a few days ago, I was flipping through my Burmese-English dictionary and happened to know that semolina is called Shwe Kyi (in Burmese), which I already known since young. 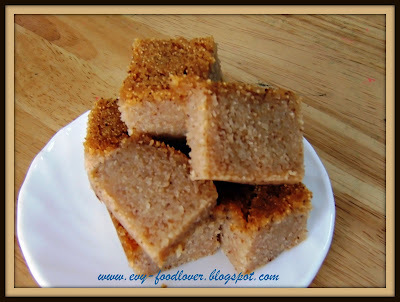 I don't know how semolina looks like in raw, as I saw before was only in finished product, cake only. 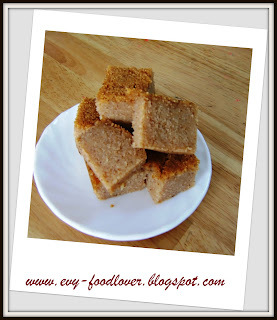 In Burma, we use Shwe Kyi (Semolina) to make cake and it is served as dessert. Since I have the whole packet of semolina, I am going to make use of it. Yes I am going to bake semolina cake (Burmese style) with the help of my little Burmese cookbook. Mix heated semolina and sugar in a bowl. Set aside. Heat the frying pan, melt the butter. Add semolina sugar mixture. Stir it well. Add in 5 cups of coconut milk and 1/2 cup of raisin. Stir continuously until a very thick batter is formed. Heat the oven to 180 degree C. Grease 8"x8" square pan and place the batter. Sprinkle poppy seed over the surface and bake for about 30-40 mins. Let it cool completely in the pan and keep it in refrigerator to set - at least for 2 hours. Cut it according to your preference size and serve. It is very good to go with a cup of coffee or hot green tea.Enjoy! Thanks!. Actually I am a very beginner and still learning how to bake cakes. Bo Bo => I ll bake it for you after your exam, k? Hi..Evy, no more new post?? i am keen in baking as well. Happen to read articles on this in Burmese as well as in English. Keep going. will be back agian.